Electric cars: power back to the people | What Car? Electric cars could not only be charged from your home or office, but in future they could also help to power them. The idea is to use the cars' power-storage capabilities to supply electricity to homes or businesses. It's one idea discussed in a new study to research smart-charging infrastructures for electric cars. One of the criticisms of electric cars is that, as they become popular, they could place a strain on national electricity grids. The smart-charging study will look into solutions for this including returning some of that charge to the grid. 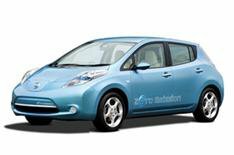 The three-year study has been set up by Nissan and General Electric Company (GE) in the US. Nissan and GE have outlined two key areas for working together. The first relates to integrating electric vehicles with homes and buildings, the second focuses on electric vehicle charging and the larger electric grid. The research team says the combined expertise will give them a full picture from energy generation to the vehicle itself of what it will take to make the grid ready.